The month of August is set to be the Buwan Ng Wika every year in the Philippines and in celebration with this, Google launches a campaign titled 'Love Your Language'. The campaign is a series of translate-a-thon event that aims to improve the quality of Filipino and Cebuano translation online. 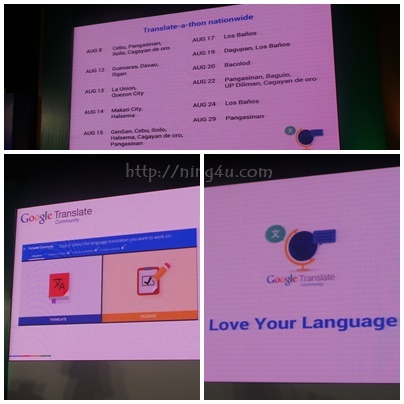 Just visit https://sites.google.com/site/loveyourlanguagephilippines to register and start to translate at your own pace. But watch out also for Love Your Language Translate-a-thon event nationwide like in Bacolod, Baguio, Cagayan De Oro, Cebu, Dagupan, Davao, GenSan, Guimaras, Halsema, Iligan, La Union, Los Banos, Makati, Pangasinan, QC and Zamboanga, which you can participate and volunteer.